No deposit / No Credit Card ! A confirmation by e-mail will be sufficient to book most these city tours from us. We will not necessary ask any advance payment or credit card guarantee especially if you are staying in hotels not far from city center. We also pick up people from airport or harbor, in which case we usually prefer to get a small advance payment. There will be price supplement for pick up from Airports. To avoid any misunderstanding, group version of city tours are not exclusively gay. There is no such a big gay tourism potential for everyday group tours in Istanbul and probably no where in the world, as you can guess. The tours are organized in cooperation with other companies. For private tours we provide experienced gay friendly guides. The places covered in our daily tours are highly recommended to be visited with professional guidance. Besides getting accurate information, you will also be protected from being overcharged & hassled by taxi drivers and shops along the way. Your tickets will be bought before hand, and you will not wait in long queues.. 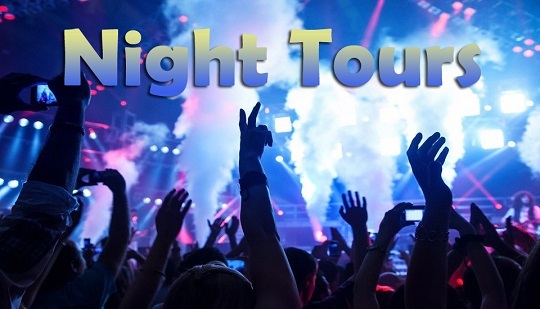 Private Gay Accompany Guide to Discover Gay Night Life of Istanbul. Visiting: Hagia Sophia (Aya Sofya), Blue Mosque, Grand Bazaar, Roman Hippodrome, Egyptian Obelisk, Serpentine Column, and German Fountain. Closing Days: Grand Bazaar is closed on Sundays, replaced with similar shopping streets. Blue Mosque will be replaced by Kucuk Ayasofya Mosque if closed for restoration etc..
Tour Rate : 35 Euro per person including pick up from hotels, English speaking tour guide, museums tickets. PS: Half day morning group tours will end in front of Santa Sophia, Sultanahmet. Return transfer to hotel is not included. Private Istanbul tour with gay/gay friendly experienced tour guides. Visiting: Hagia Sophia, Blue Mosque, Roman Hippodrome and Grand Bazaar Blue Mosque will be replaced by Kucuk Ayasofya Mosque if closed for restoration etc.. Closing Days: Grand Bazaar on Sundays replaced with Arasta Bazaar; Hagia Sophia on Mondays, replaced with Underground cistern. Tour Rates: Please ask. We offer special prices for classic private tours. Per person price of private tours depends on total number of participants, going down to 50 Euro for larger groups. Includes: Tour rates include private English speaking tour guide. All museums tickets. Transfers from / to your hotel (except from hotels near tour area). There maybe surcharges for pick up from Airports or from hotels far from city center. 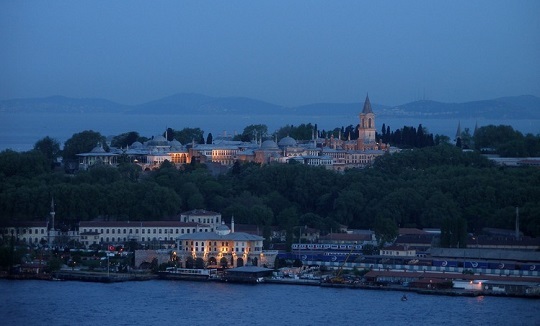 Visiting: Topkapi Palace and Tombs of Ottoman Sultans. Tour Rate : 35 Euro per person including hotel transfers, guidance in English, museums tickets. Private tour with gay friendly experienced tour guides. Visiting: Topkapi Palace, Blue Mosque, Hippodrome area and Grand Bazaar. Closing Days: Grand Bazaar on Sundays, replaced with Arasta Bazaar; Topkapi Palace on Tuesdays, replaced with Underground cistern. Blue Mosque will be replaced by Kucuk Ayasofya Mosque if closed for restoration etc.. Visiting: Hagia Sophia, Blue Mosque, Topkapi Palace, Hippodrome, Obelisk of Theodosius, Serpentine Column, Constantine Column, German Fountain, Grand Bazaar, and Tombs of Ottoman Sultans. Closing Days: Hagia Sophia on Mondays replaced with Underground Cistern, Topkapi Palace on Tuesdays replaced with Bosphorus Boat Tour. Grand Bazaar on Sundays replaced with authentic shops in old city. Departure : Hotel pick up between 08:00-08:30 am, returning back to your hotels around 16:30-17:00, depending hotel locations. Visiting: Hagia Sophia, Blue Mosque, Hippodrome area, Topkapi Palace and Grand Bazaar. Closing Days: Hagia Sophia on Mondays, Topkapi on Tuesdays, can be replaced with Underground Cistern; Grand Bazaar on Sundays replaced with Arasta Bazaar. Blue Mosque will be replaced by Kucuk Ayasofya Mosque if closed for restoration etc..
Tour Rates: Please ask. Per person price of private tours depends on total number of participants, going down to 60 Euro for larger groups. Visiting: Spice Bazaar, Bosphorus boat cruise up to Rumeli Fortress (seen from outside). Also seen (from the boat) during the cruise Imperial Gardens of Yildiz Palace, Ciragan Palace, Dolmabahce Palace, Beylerbeyi Palace, Bosphorus Bridge connecting Europe and Asia. Closing Days: Spice Bazaar on Sundays replaced with other authentic shops in old city. Note: Bosphorus cruise will be practiced on regular public boats if there is no sufficient number of attendant provided for private boat for tour participants. Tour Rate : 35 Euro including transportation, hotel transfers, English speaking tour guide, all museum tickets. Visiting: Dolmabahce Palace the last residence for Ottoman Sultans and Yildiz Royal Garden was once part of the imperial garden of Yildiz Palace. Departure : Pick up from your hotel between 08:00-08:30 returning around 13:00 depending on location of your hotel. Tour Rate : 40 Euro including transportation, English speaking tour guide, all museum tickets. Closing Days: Dolmabahce on Mondays and Thursdays replaced with Chora Church. Tour Program: Pick up from your hotel, after a mini sight-seeing tour visit Spice Bazaar, take a mini boat cruise on Bosphorus straight up to Rumeli Fortress (seen from outside), crossing Bosporus Bridge (from Europe to Asia), tea break at Camlica Hill on the Asian side offering the best panoramic view of Bosphorus and Istanbul, visiting Beylerbeyi Palace on the Asian shore and transfer to your hotel. Closing Days: Beylerbeyi on Mondays and Thursdays replaced with Chora Church, Spice Bazaar on Sundays replaced with other authentic shops in old city. Tour Program: Operated everyday and in all season and everyday Princes' Islands tour will start with and unforgettable ferryboat cruise on the Marmara Sea to Princes' Islands, stoping at Buyukada (the Grand Island), the popular summer resort with sandy beaches and pinewood scenery, once the pleasure island of Byzantines Princes. You will take a tour of the island with horse-drawn carriages before lunch at a fish restaurant. Evening return to Istanbul and transfer to hotels. Departure: Pick up from hotels around 08:00-08:30 am, returning by 17:00-18:00 depending on the location of hotels. 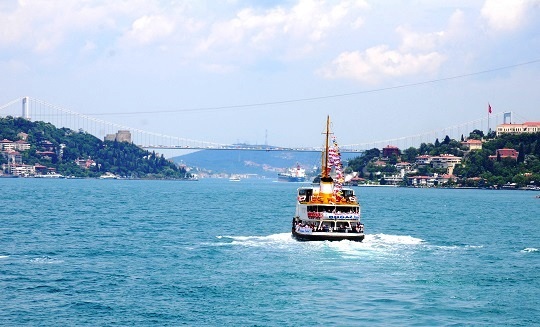 A traditional and unforgettable boat trip on the Bosphorus straight, separating Europe from Asia. 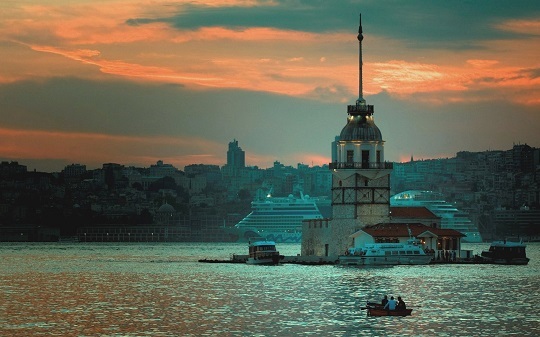 Its shores offer a delightful mixture of past and present, grand splendor and simple beauty, decorated with beautiful shorefront wooden villas, marble imperial palaces, stone fortresses, small fishing villages both on both sides..
Boat Trip: An enchanted night cruise will start while you sip your welcome drink as the sun sets on Istanbul. We will pass beneath the Bosphorus Bridge by moonlight, watching Ciragan and Dolmabahce Palace on the European shores and Beylerbeyi Palace and Anatolian Fortress on the Asian shores. Dinner: A very generous menu will be served including a rich variety of hors d'oeuvres, main meal with grilled fish, chicken or meatballs options, fresh season's salad, fruits, dessert and unlimited (soft and alcoholic) local drinks. Shows: This is not just a cruise, but a traditional way of Turkish style entertainment. Show program includes shows such as international & Turkish live music, DJ music, belly dancers or other local folk dance performances. Tour Time: You will be picked up from your hotels around 19:00-20:00 and return around midnight. Pick up time depends on the location of your hotel. A more specific pick up time will be indicated after completing your booking. We can book a private boat for Bosphorus Cruise and organize dinner or other shows for you. The price of this cruise will depend on the number of participants, the size and capacity of the boat, duration of the cruise, extra activities requested, quality of the meal and drinks. Please tell us your expectations and ask for more. We will pick you up from your hotel (city center hotels), then you will meet with your group and guide at the meeting point. We will cruise on Bosphorus, visit Pierre Loti Hill, Cable Car, Citty Wals (by bus), Golden Horn (by bus). We will drop you off to your hotel at the end of the tour. *Bosphorus by boat-An amazing cruise between the two continents, Europe and Asia, along the Bosphorus. *The Rumeli Fortress (from the sea)-Castle was built by Mehmet II to prevent the Byzantine fleet, which had control of the Bosphorus. 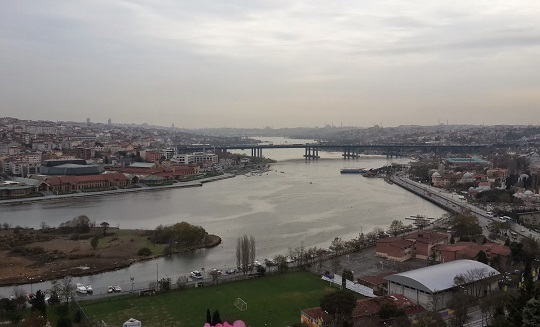 *Golden Horn (by bus)-As natural and secure harbor, the Golden Horn inlet has played an important role in the development of Istanbul..
Departure: Everyday. Availability of the tours depends on number of participants, and will be clear short time before. Please ask 1-2 week before. Tour Time : Daily departs at 13:00-13:30 and returns around 17.00-17:30. Pick up / return times depend on location of hotels. More specific times will be informed during booking procedure. Please see below for special deals and last minute offers for hotels in Istanbul.